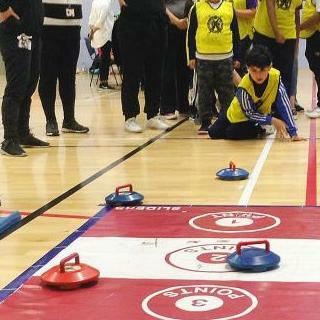 On Tuesday 19th March, eight lucky children from PLM went to the Walthm Forest Feel Good Centre to take part in the Waltham Forest Primary Schools Mainstream Panathlon. There were roughly ten teams from various schools across the borough. The children were able to take part in nine different events throughout the day which had been adapted to be fully inclusive. Some of the activities were: bean bag throw, parachute popcorn, kurling, polybat, basketball, flight path and table cricket. Here is a wonderful video of the children playing Parachute Popcorn which shows you just how much fun they had. Being lead by children from the provision at Chingford Foundation made the day even more special and successful for the children. The leaders lead beautifully and were patient and kind throughout. The children behaved amazingly and the adults responsible for them were very proud of how they represented the school. South Grove’s Provision were proud runners-up and have certificates and medals to prove it. I am so proud that I will be adding their photo the Sport Shelf of Fame. As soon as I have a frame, it’ll make its way to the library so keep an eye out. We started off on skittles and ended up on the mini basketball.We earned points for the games we took part in. I want to thank Ms Mullins and all the adults in PLM for taking us. The PLM children were amazing and all tried amazingly hard. We are so excited for our next sports trip.